Winchester was established in 2014 with the preliminary objective of acquiring oil and gas leases and working interests (WI) in areas situated on the Eastern Shelf of the Permian Basin in Texas, USA, a location which offers several prospective unconventional oil opportunities in Wolfcamp shales at shallow depth together with attractive conventional oil targets in the Ellenburger Formation at slightly greater depth (between 6,000 and 7,500ft). 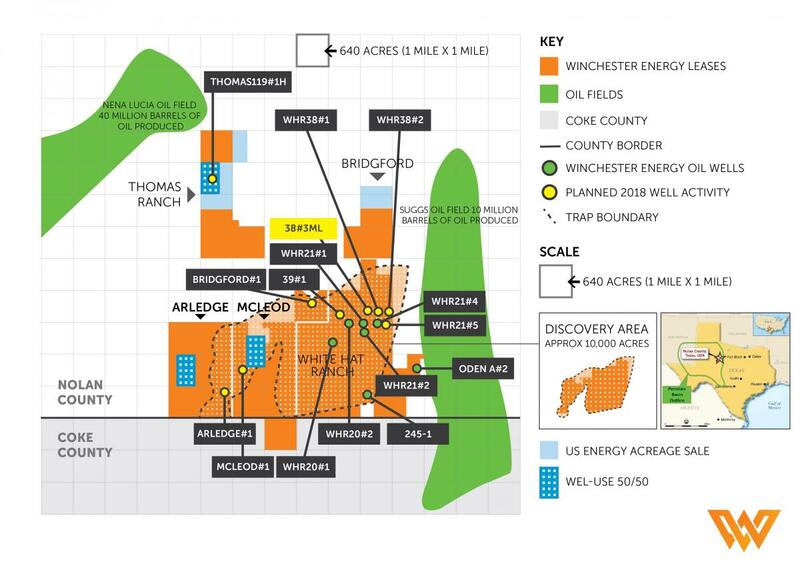 The existence of several known oil and gas producing horizons (‘stacked pay’) within Winchester’s dominant acreage position represents tremendous opportunity and upside for the Company going forward. Concurrent with establishing a dominant land position in the Permian Basin, Winchester commenced exploration drilling with subsequent oil and gas production achieved in 2015. As at 31 March 2018 Winchester had acquired 17,402 net acres incorporated within five leases in the highly productive Eastern Shelf of the Permian Basin in Texas, USA. 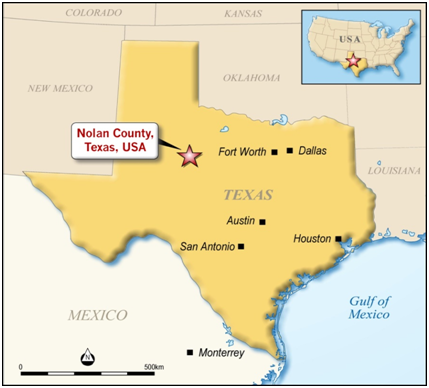 The Company has 17,402 net acres of oil and gas leases situated in Nolan County and Coke County in Texas, USA. In conjunction with operator, Carl E Gungoll Exploration LLC (CEGX), Winchester has drilled a total of eight vertical oil wells within its White Hat oil and gas lease. Seven of these wells have been completed in the deeper Ellenburger Formation and one well completed in the shallower Strawn Formation. Winchester’s wholly owned USA subsidiary, Winchester Energy USA Holdings Inc., owns a 75% working interest in the oil and gas mineral rights of the 7,058 acres which surround and adjoin these existing eight White Hat wells (Winchester 50% WI). CEGX own the remaining 25% WI in these 7,058 acres. Winchester is operator of the 7,058 acres of the White Hat ranch oil and gas lease outside of the eight presently drilled 40 acre drilling units (being a total of 320 acres). The following table outlines the oil production of the Company, on a quarter by quarter basis. * These figures show gross oil production only (they exclude gas sales). Winchester is entitled to its Woking Interest share of net proceeds after royalty payments to the oil and gas mineral rights owners. The Company has established an area of 10,000 acres (see map below) which extends over three oil and gas leases and partially a fourth, where the Ellenburger Formation has been proven productive in several wells and is expected to be productive based on recent drilling results, new technologies and 3D seismic interpretations. The Ellenburger Formation is variable in its reservoir characteristics, its porosity and permeability, its fracture density and the ratio of dolomite and limestone. The Company plans to test and evaluate several completion techniques to improve well productivity when required. This is anticipated to improve the economics of wells which have low initial productivity with standard completions. In the nearby 12,000 acre Suggs Oil Field, total oil production to date is around 10 million barrels of oil (bo) from just over 100 wells, indicating an average of 100,000 barrels of oil per well. There were several excellent wells within the Suggs Oil Field with the highest producing over 400,000 barrels of oil over 30 years. 15% of wells recovered over 200,000 barrels of oil and 30% of the wells produced under 50,000 barrels of oil and were sub economic. The highest IP rate was 432 barrels of oil per day (bopd) and the average initial production (IP) of the top 6% of wells was 364 bopd. Winchester’s technical team believes its Ellenburger play will have similar characteristics to the Suggs Oil Field and that utilising modern techniques to improve well productivity will significantly enhance field economics. To this end, Winchester has implemented ultra-short radius horizontal lateral drilling that allows for multiple short distance laterals to be drilled from a single well bore. By applying some or all of these modern techniques, Winchester plans to improve well productivity at relatively low cost. In late 2017, the Company successfully drilled three horizontal lateral legs in White Hat well 38#3ML for a cumulative 1,679 feet, with 430 feet of oil and gas shows. The first leg flowed oil and gas to the surface for several hours after drilling into a fracture zone. Following the drilling of all three horizontal legs in December 2017, the well was tested using an Electrical Submersible Pump (ESP) followed by a conventional rod pump. The highest production rate recorded was 40 bopd. Following analysis of Ellenburger reservoir pressures in the White Hat 38#3ML well, Winchester has concluded that at least two of the White Hat 38#3 ML lateral well bores intersected a large fracture oil reservoir system that was pressure depleted as a result of oil production from the adjacent White Hat Field, (WEL 50% WI). The lateral drilling at White Hat 38#3ML has confirmed the viability of ultra-short radius horizontal drilling in that the Company can achieve greatly increased exposure to oil bearing rock when compared to a vetical and, from an engineering perspective, the laterals can be completed successfully. The Company is currently in the process of exploring additional ultra-short radius lateral drilling opportunities across the field in areas that have not been subject to reservior depletion. To date, Winchester has focussed on drilling and producing oil and gas from its deeper Ellenburger Formation discovery but from the founding of the Company, it has recognised the potential for oil in a number of shallower reservoirs (“stacked pays”), including the Strawn Formation which occurs within Winchester’s acreage in Nolan County, Texas, USA. To date, all of the Company’s wells targeting the Ellenburger have encountered shallow zones with varying oil production potential in their own right. In April 2017, Winchester announced initial production rates of 200 bopd from the Fry/Strawn Formation in White Hat 20#2 well. This well, which was fracture stimulated, continues after nearly a year of production to be an excellent producer at 60 bopd and has produced over 25,000 barrels. Reservoir engineers Kurt Mire and Associates have ascribed a proved producing (1P) Estimated Ultimate Recovery (EUR) of 70,000 bbls for this well. The result in White Hat 20#2 constitutes a significant new oil discovery in a sand unit within the Strawn Formation. The current significant oil production rate has arisen from simple, low cost, small scale fracking. Various sand units such as the Strawn occur at several stratigraphic levels and have produced significant oil from stratigraphic traps in the nearby Suggs Oil Field and White Hat ranch area and beyond and have been labelled or referred to as Fry, Gardner, Lazarus, Jennings Lime, and Goen sand units. Winchester is evaluating logs, well samples and seismic data across its acreage and have identified several candidates prospective for re-completion in sand units overlying the Ellenburger Formation. It should be noted that all ten wells drilled to date targeting the Ellenburger Formation have obtained promising oil and gas shows in several of the overlying formations, many of which have a strong history of oil production in the East Permian Basin. These overlying formations (being shallower than the Ellenburger Formation), include units of the Wolfcamp Shales known as the Upper Cline (otherwise called the “Three Fingers Black Shale”), the Lower Cline (otherwise called the “Lower Penn Shale”) and the Barnett Shale Equivalent. All three shale oil plays are blanket resource plays across all of Winchester’s acreage.